This is not a common chorus / delay / surrounder VST effect. Such effects tend to break the mono compatibility and even wash out the sound. Download the free version to see how it works for you. The full version offers a low- & high-cut filter, making it more convenient to stereoize only the mid-frequencies. In this way, you can avoid unwanted bass "side effects". Mono compatibility remains a very important part of music production, because music is often played back in mono or with a poorly reproduced stereo. For example, think about loudspeakers in shops and workplaces, and those built into laptops, smartphones and many radios. More people are listening to music in these ways than ever before, and a professional audio production is expected to shine everywhere it is being played. The Hbasm Stereoizer aims to help musicians and sound-engineers deal with this challenge. It adds a pleasant fullness and stereo-width to almost any incoming sound, regardless of whether that sound already contains stereo information or not. At the same time, the effect is completely cancelled out when the left and right audio channels are summed to mono, thus, it is mono-compatible in a traditional sense. 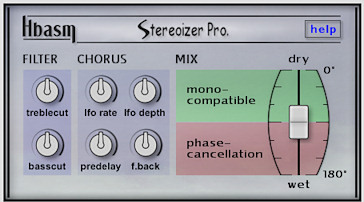 Depending on your settings, the Stereoizer will introduce noticable flanging effects when only one audio channel can be heard (either the left or right channel). This may be desired or not, so I advise you to always check how your production holds up under these circumstances. Chorus section (LFO rate, LFO depth) with Pre-delay to adjust the stereo effect. MIX fader (dry / wet) to adjust the amount of "stereoizing". Help button for quick help. * Only available in the full version. First you hear the unprocessed sound, then the stereoizer comes on.